This name uses Spanish naming customs; the first or paternal family name is Cáceres and the second or maternal family name is Flores. 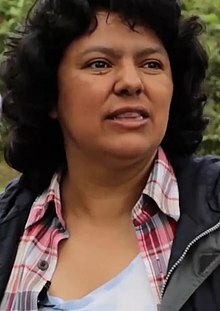 Berta Isabel Cáceres Flores (4 March 1971, 1972, or 1973 – 2 March 2016) was a Honduran environmental activist and indigenous leader of the Lenca people. She was co-founder and coordinator of the Council of Popular and Indigenous Organizations of Honduras (COPINH). She won the Goldman Environmental Prize in 2015. Cáceres was killed in her home in La Esperanza, Honduras. She was killed by armed intruders, after years of threats against her life. She was aged 42. ↑ "En memoria de Berta Cáceres: una mujer e indígena excepcional". Diario El País (Spain) (in Spanish). Retrieved 2016-03-07. ↑ "Bert Cáceres, hondureña que entregó su vida en defensa del ambiente". La Prensa. 3 March 2016. Retrieved 2016-03-08. ↑ "Berta Cáceres festejaría hoy su cumpleaños". Diario La Prensa (in Spanish). Retrieved 2016-03-04. ↑ Redacción/EFE. "Matan a Berta Cáceres, líder indígena hondureña". Diario La Prensa. Retrieved 3 March 2016. ↑ "To Defend the Environment, Support Social Movements Like Berta Cáceres and COPINH". Retrieved 3 March 2016. ↑ "Berta Cáceres: "Green Nobel." Also, Galeano on The Right to Delirium". Retrieved 3 March 2016. ↑ "Cáceres, Threatened Honduran, Wins Biggest Enviro Award". Radio Free. Retrieved 3 March 2016. ↑ Malkin, Elisabeth; Arce, Alberto (2016-03-03). "Berta Cáceres, Indigenous Activist, Is Killed in Honduras". The New York Times. ISSN 0362-4331. Retrieved 2016-03-04. This page was last changed on 1 April 2019, at 11:50.